Congratulations Phoebe!! YourNurseIsOn.com supports women in technology and advocates for increased math, science and engineering education opportunities for our young women!!! Good Job Phoebe!! YourNurseIsOn.com Congratulates CFO Phoebe Browning And Wishes Her Good Luck at Tonight's 2010 'Women of Innovation' Awards! YourNurseIsOn.com congratulates CFO Phoebe Browning and wishes her the best of luck at tonight's 2010 'Women of Innovation" awards. All of tonight's nominees are exceptional women and we are proud to have Phoebe amongst them. Phoebe has been instrumental in bringing YourNurseisOn.com from a mere conceptual inkling to a full fledged healthcare staff communications powerhouse. 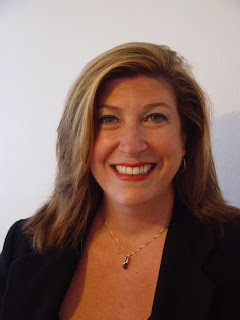 Her expertise, dedication, intuition and leadership have been instrumental in the success of YourNurseIsOn.com, and we are honored to have her as an integral part of our team. We would like to thank the Connecticut Technology Council for their tireless work supporting technology companies in Connecticut. 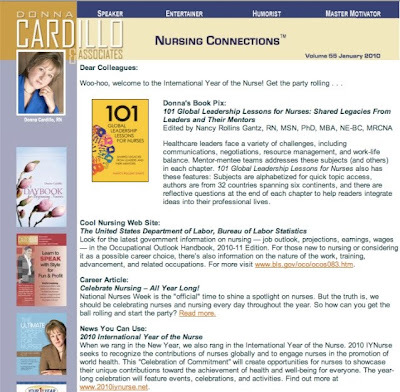 What do you say when one of the most well-respected names in the Nursing profession spotlights your CEO as their lead-off Entrepreneur Spotlight for 2010 the "International Year of the Nurse"?? 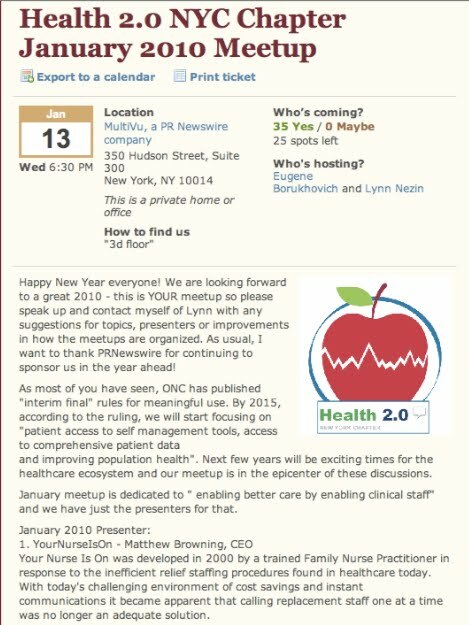 YourNurseIsOn.com CEO Matthew Browning, MSN, RN to present at the New York City Health 2.0 Meetup on January 13, 2010. As the kick-off presentation for 2010 for NYC's Health 2.0 Meetup, YourNurseIsOn.com will present their award-winning Healthcare Staff Communications System to New York City! Join the Meetup Group or just come on by to see the "next thing" in healthcare communications. YourNurseIsOn.com helps Hospitals, Healthcare Facilities and Nursing Agencies contact AND confirm their healthcare providers, and other staff, INSTANTLY- by two-way text, email, and phone communications. YourNurseIsOn.com increases your channels of communication, your reach and your chances of finding the right nurse, for the right shift, right now- where THEY are. YourNurseIsOn.com simplifies finding staffing coverage, communicating with your organization and demonstrating compliance with our easy, and thorough reporting. Resolve, for 2010, to hang-up on calling staff one at a time, and you'll have a Happier New Year! We can do over 8 hours of calling in under 40 minutes and add two-way text and email channels to your instant communications needs. RSVP! We look forward to seeing YOU there!! Happy New Year to all of our YourNurseIsOn.com families, friends, staff, customers, vendors and investors! We would like to take a moment to thank all of our YourNurseIsOn.com families. friends, staff, customers, vendors and investors for you all you have done this past year and to wish ALL OF YOU the very best year that 2010 can be. We have achieved many milestones this year and are prepared to help many more clients during this coming year. We have achieved international recognition, incredible market awareness and acceptance, done demonstrations nationwide, participated in major events, been mentioned in prominent media and helped many wonderful clients. None of this would have been possible without you all! We look forward to continuing to serve our clients, respond to their needs, solve challenges together and to continue to build mutually beneficial relationships with our customers, vendors, investors and staff.